Dice the bacon and cook in a fry pan. Remove the bacon and set aside. 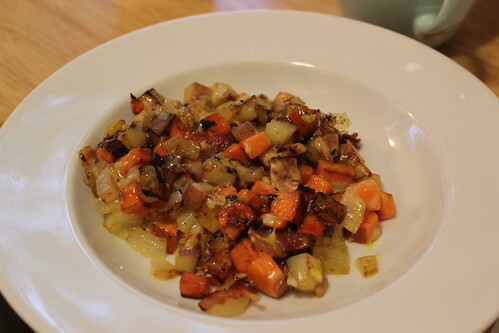 Cook the sweet potato and potato in the bacon grease until nearly done. Add the garlic and the bacon for the last 1-2 minutes. Top with the shredded cheese and let it melt together. Notes: I soaked up some of the bacon grease with a paper towel. This is, again, one that can be made with whatever veggies you have around. We also sometimes top the hash with a fried egg, just didn’t feel like it today. This is also a lunch item for me, easy to throw together quickly. 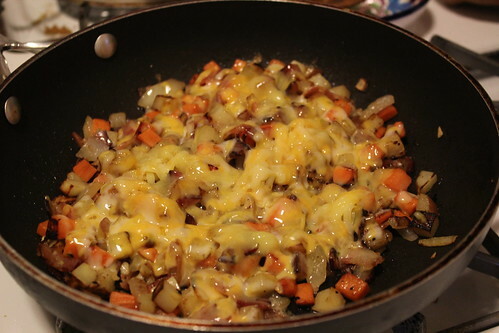 This entry was posted in breakfast, cheese, eggs, garlic, potato, sweet potato. Bookmark the permalink.